Make a new friend with Kathleen George's creations. The finger friend is a fun and exciting adventure you can have with your kids. It's easy too. Find this craft and 21 other crafts for kids in our FREE Summer Crafts for Kids eBook. You can also find this project in our free eBook, Family Fun Crafts: 16 Craft Ideas for Kids! If desired, paint balls of STYROFOAM. Push a skewer into the balls to hold while painting; place skewers in a block of foam to hold while balls dry. 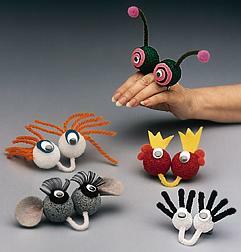 Cut felt shapes for eyes; glue wiggle eyes to felt or attach wiggle eyes directly on plastic foam balls. Glue on other features such as pom-poms and eyelash curls, or felt ears and eyelids. Dab glue onto foam and use a skewer to push materials such as yarn into the foam for hair. Insert chenille stems into foam for antennae or eye lashes. For antennae, gently curve chenille stems and glue pom-poms onto the tips of shaped chenille stems; dip in glue and insert into foam. Modify the finger puppet instructions to create a finger friend that resembles your school mascot, favorite pet or other character. Buttons, sequins or glitter are other objects that might inspire your creativity. Oh my gosh, I laughed out loud when I saw these. They are so cute. I have four grand kids that would just afore these little guys. They can help me make each one so everyone has a special one just for themselves. Thank you for sharing a great summer project. My preschoolers in my home daycare will love making these! Sometimes its hard for them to squeeze the glue out of the bottle, so I pour some in a container and let the kids dip in a popsicle stick to get their glue out. I use a small, glass votive candle holder because its heavy and doesnt tip over like a lightweight plastic dish would. Its also deeper than wide, so you dont have to put in a lot of glue for the kids to get enough glue on their sticks. These look a little weird... I like them! I kind of want to make the mice ones with my goddaughter. Who knows? We may end up creating a new creature. Nice tutorial! Great idea project for pre-schoolers.Keep their interest and fun learning activity. i like this very much =) so cute and fun.